As any designer knows, making a big change to a site with as many users as Facebook has is going to cause a lot of complaining. With that in mind, I’ve tried to get used to the new feed over the last few weeks — and I still hate it. The new news feed is like watching CNN during a breaking news event: you can watch for hours and hours and only get two or three bits of interesting information amid the endless blather. It’s a giant step backward and as more people get on Facebook and become more active it’s going to become worse. Feed items from frequent users drown out feed items from infrequent users. Friends seem to be treated equally. It rewards spammy applications, such as the quiz applications that seem to pop up every day and apps like PicDoodle. It doesn’t eliminate duplicate items. If 10 people post the same item, it’ll be inserted multiple times. As much as I love the Twitter parody by current.tv, I don’t need to see it anymore. This is made worse by the use of URL shorteners that obfuscate the item you’re clicking on. One of my design philosophies is that you shouldn’t make users do work that computers can do better. Filtering and priortizing is high on that list. The old Facebook news feed algorithm and the current highlights section provided some level of this. Degree of interaction. Items from people I interact with regularly should be prioritized higher. Number of friends involved. The greater the number of friends involved, the higher the priority. Number of times shared. The more of my friends that have shared it, the more likely it is to be of interest. Location. I’m more interested in things happening near me than on the other side of the country. 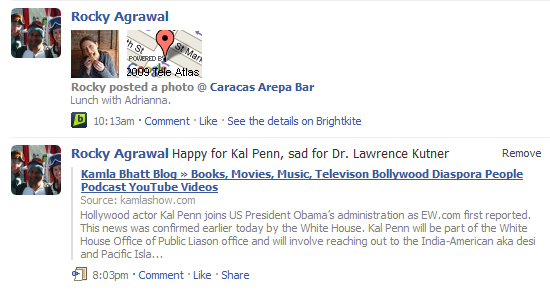 Facebook will need to become aware of locations that are being embedded by applications such as Brightkite. Posting frequency. If someone rarely posts on Facebook, the odds are good that when they do post, it’s something important. Application usage. If I use the same app, I’m more likely to be interested in the content that the app generates. Topic similarity. If the item is about a topic that I frequently post about, it should get a boost. Been there, done that. If I’ve seen it already, it should be downweighted. The ideal feed would adapt to visit frequency. Someone who visits every five minutes would see a feed very similar to today’s feed. Someone who visits once a week, would see a “best of” from the week. Some of these things are harder to do than others, but any sort of this filtering is better than what I see today.Any algorithm will undoubtedly miss something that I care about, but the current endless river of unfiltered content ensures that. Besides, there’s a trick I use when I want to bring someone’s attention to something: instead of hoping that they see it on my feed, I message them directly. This entry was posted in facebook, search, social networking. Bookmark the permalink.